Start off your St. Patrick's Day with the Lucky Charm 5k Run at Mo's Irish Pub in Katy. Admission Tickets range from $35 to $45 and registration for kids is $15. Click here for more information. 94.5 The Buzz, Lucky's Pub, and AWE Productions present the 11th Annual St. Patrick's Day Festival in EaDo. Wear green and enjoy 3 stages of live music, costumes, food trucks, and plenty of green beer. Admission Tickets range from $10 to $100. Click here for more information. Learn how to make homemade kombucha and wild fermented root drinks such as Ginger Beer, Turmeric Beer, and Sunchoke Beer at Finca Tres Robles. Admission Tickets are $40 per person. Click here for more information. 94.5 The Buzz, Lucky’s Pub West, and AWE Productions present the 11th Annual St. Patrick’s Day Festival in Katy. Wear green and enjoy live music, costumes, food trucks, plenty of green beer, and an afternoon appearance from 94.5's The Rod Ryan Show. Admission Tickets start at $10. Click here for more information. Adults and kids alike can take part in some St. Patrick's Day Shenanigans at The Phoenix on Westheimer. There will be food and drinks for sale and activities for everyone. Admission No cover. Click here for more information. Cruise down Buffalo Bayou on a relaxing, 30-minute boat ride with friends or family on the second Saturday of every month. Soak up the warm, spring weather while you keep an eye out for jumping fish, native birds, and even the occasional alligator. Admission Tickets are $7. Click here for more information. Make your way to Washington Ave. as participating bars including Clutch Bar, Lincoln Bar, and more host the 3rd Annual Green Mile & St. Patrick's Day Block Party. Toast with your buddies and enjoy food, live entertainment, raffles, prizes, and more. Admission Tickets range from $5 to $15. Click here for more information. Put on your leprechaun costume and choose from a 3-mile or 5-mile run at Buffalo Bayou Brewing Company. Admission The run itself is free, but admission to the brewery is $10 a person. Click here for more information. St. Patrick’s Day Party at City Acre Brewing Co.
City Acre Brewing Co. hosts a free St. Patrick's Day Party with the release of their Bellington Imperial Red beer, food, and more. Admission Free to attend. Click here for more information. Bring your friends and family to the Town Green Park in The Woodlands for their 2nd Annual Woodlands Shamrock Shindig. Enjoy live music from bands, DJs, bagpipers, food trucks, St. Paddy's-themed drinks, and a kids zone. Admission Tickets are $5. VIP tickets are $60. Click here for more information. McGonigel's Mucky Duck hosts their 29th annual family-friendly St. Patrick's Day celebration. Indulge in some Irish food, drinks, bagpipers, and live music while the little ones enjoy a tea party, arts and crafts and more. Admission Tickets are $22. Click here for more information. 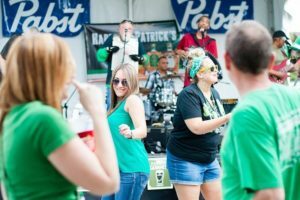 Make your way to Sugar Land for their St. Patrick's Day party featuring drink specials with a full bar, a crawfish boil, Irish food, and a DJ. Admission Free to attend. Click here for more information. Put on your lucky green attire and celebrate St. Patrick's Day at King's BierHaus on The Heights. Enter the fully decorated bar and restaurant and enjoy Irish drink specials, green beer, bangers and mash, and live Irish music beginning at 5pm. Admission No cover. Click here for more information. Enter the mind of an artist through a photography scavenger hunt, participate in a poetry in action tour, get creative with optical illusion crafts and more at Family Day at the Contemporary Arts Museum. Admission Free to attend. Click here for more information. Take part in an arts and crafts activity at The Square every Saturday with Abrakadoodle at Memorial City. Best for children ages 5 to 10. Admission Free to attend. Click here for more information. Marvel at a runway-style Fashion Show curated by CAMH’s Teen Council featuring cutting-edge designs from Houston-based teens. Admission Free to attend. Click here for more information. The Houston Livestock Show and Rodeo present the award-winning country singer, Brad Paisley in concert at NRG Park as part of their 2018 rodeo lineup. Admission Tickets start at $18, but you may find cheaper or better seats on TicketNetwork’s online resale market. Click here for more information. Wear all green and get lucky at this St. Patrick's Day Party at Howl at the Moon with green beers, car bombs, green tea mini-buckets, and a buffet. Admission No cover. Click here for more information. Sherlock's Baker St. Pub on Westheimer host a parking lot party for St. Paddy's Day that includes food trucks, live music by The Dirty Reckless, Adrenaline, and a DJ, and of course, green beer. Admission Cover charge is $10. Click here for more information. Toast to all things Irish as you enjoy light bites and tasty brews from Saint Arnold’s Brewery on a boat tour around Buffalo Bayou. The boat will depart from Allen's Landing. Admission Tickets are $40 per person. Click here for more information. Shop for everything from art to furniture and collectibles from a variety of vendors while enjoying live music and food trucks during Discovery Green’s Flea by Night. Admission No cover charge. Click here for more information. See the art show, Radio Redux, a photography exhibition celebrating analog and alternative photography at The Hardy & Nance Studios. Admission Free to attend. Click here for more information. Kick off Miller Outdoor Theatre’s 2018 free concert series when renowned salsa singer Menique joins Jose Valentino to perform with Houston’s premier youth group, “Caliente.” Directed by Grammy-nominated Music Educator Jose Antonio Diaz, this free show is sure to deliver an exciting Saturday night. Admission Free to attend. Click here for more information. Watch the action-packed movie about two Irish Catholic vigilante brothers, The Boondock Saints, just in time for St. Patrick's Day at Alamo Drafthouse Mason Park. Admission Tickets start at $12.99. Click here for more information.